Despite boasting beautiful scenery, fabulous wines and one of the most diverse cuisines in Italy, Friuli remains off the beaten track for all but the most adventurous of tourists. Few parts of Friuli are as striking as the Adriatic coast, especially as you make your way up the small towns that dot the Gulf of Trieste. Duino, a small, quaint fishing village with a dramatic castle perched on pure rock, offers easy access to the ocean and fabulous food. Alla Dama Bianca excels with the classics. There is nothing fancy here, just pure renditions of traditional Italian coastal cuisine. 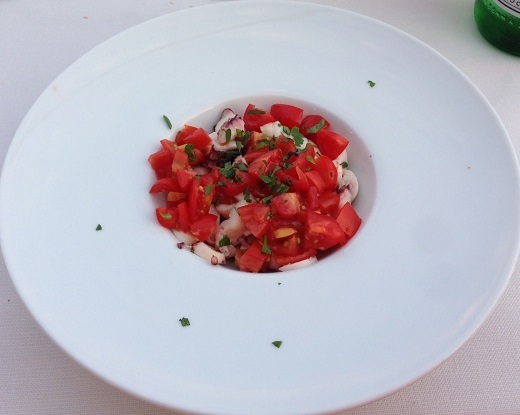 The octopus salad is incredibly tender and flavorful. How can something so simple be so delicious? 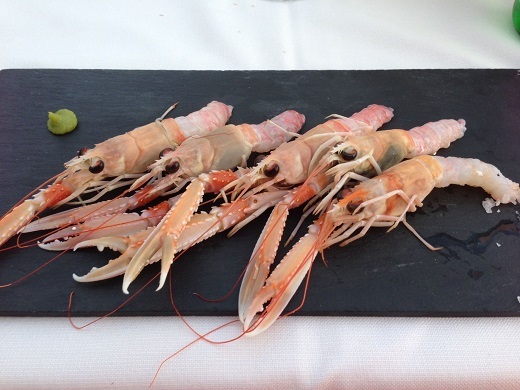 A plate of raw scampi is bursting with the pure flavor of the sea. 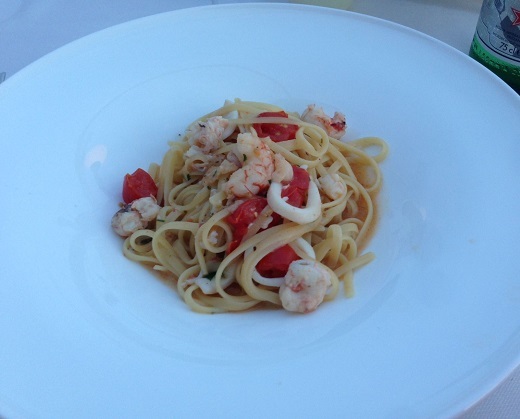 My linguini with sautéed shrimp and calamari is another lesson in less is more. 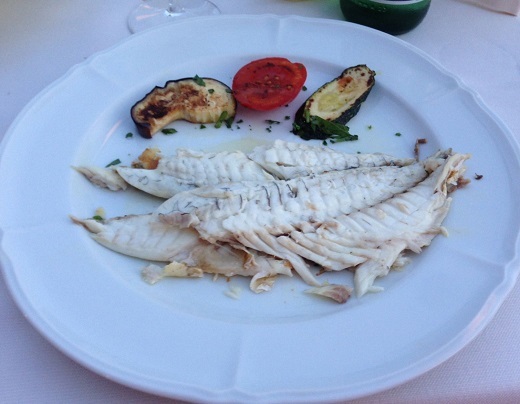 One of the joys of the Italian table is a simple grilled whole fish, topped with just a drizzle of local olive oil. Nothing else is needed when fish is this fresh and perfectly cooked. The flavors literally seem to jump off the plate. But we are still hungry. 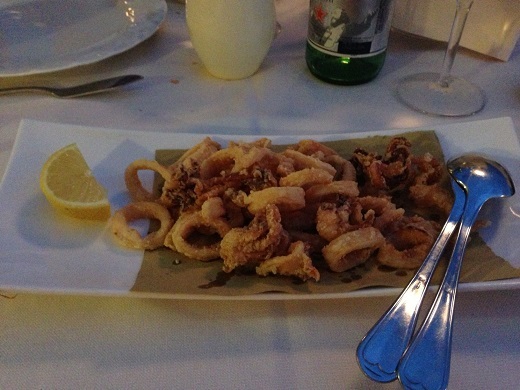 A plate of delicious fried calamari takes care of that. Alla Dama Bianca has a very good wine list for a restaurant of its size. Two of my favorite producers, Borgo del Tiglio and Edi Kante, are heavily represented. We are in the Carso, so what could be better than Kante’s 2011 Sauvignon? Fresh, intensely varietal flavors and bright acidity work beautifully with the food. 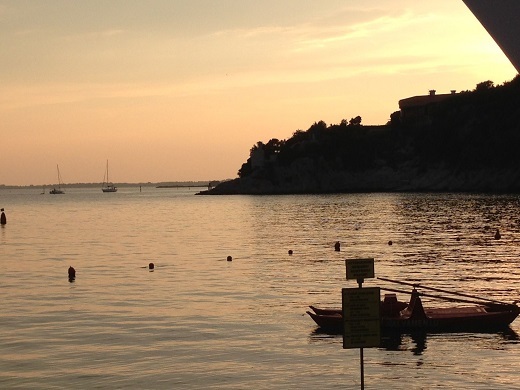 We finish the last glass as the sun sets over the horizon in one of the most beautiful spots on the Adriatic coast.